I am starting this tea blog mostly as a way to organize and share my notes, photos, and thoughts about various teas I enjoy (or even the ones I do not enjoy). I have been drinking tea on and off for as long as I can remember, but it was not until late 2014/early 2015 that I began to drink it on a more serious level and challenge myself to try many different kinds of teas and really get to know the flavor profiles of each one and perfect my brewing methods with each one. I hope to post a mix of short tea reviews/tasting notes among some lengthier writings, and also whatever else tea-related I find myself interested in over time. 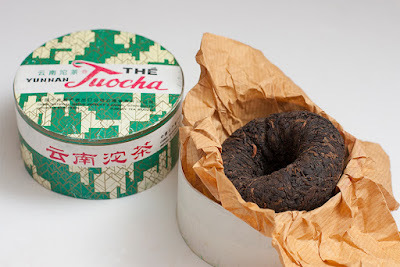 The tea that really motivated me to take the plunge into the world of tea is nothing more than a 2003 Xiaguan "Xiao Fa Tuo" shou puerh. Someone with a lot of experience in puerh might consider this a "daily drinker" -- a good tea, but nothing to get too excited about. To someone new to Chinese teas though, a name like that can be a bit intimidating. Not to mention the appearance of the tea itself. A nest-shape of tightly compressed brown worm-like leaves that smell like something which should be left outside, not brought into the kitchen where we prepare and eat food. But to me this round green box contains more than just tea-- it has the ability to conjure memories of the past and generate new ones. Having grown up in central Kentucky, the aroma of this shou puerh brings memories of home. It has a distinct earthy aroma that I describe as a "horse farm," which might sound bad, but it's actually a good thing to those who live in the horse capital of the world. Truth is, I find riding horses quite terrifying though I have done it a few times, but my family has a tradition of going to the track a couple times a year to watch horses race. Sometimes though I find that we spend less time at the side of the track and more time in the paddock enjoying the horses in a calmer setting. Another similar aroma I find in this Xiaguan shou is that of a tobacco drying barn. As a kid in Boy Scouts years ago we would often go camping on various farms, and one in particular that I remember had a black tobacco drying barn at the edge of the main field. During rainy weather we would hold our meetings inside the barn surrounded by the big leathery brown leaves hanging from the rafters. Tobacco farming in Kentucky has been declining for years and I rarely see the crop growing anywhere now days, but the Xiaguan shou aroma makes it feel like I am back in that barn right now learning to tie knots, read topographical maps, and carve wooden sculptures with a pocket knife. 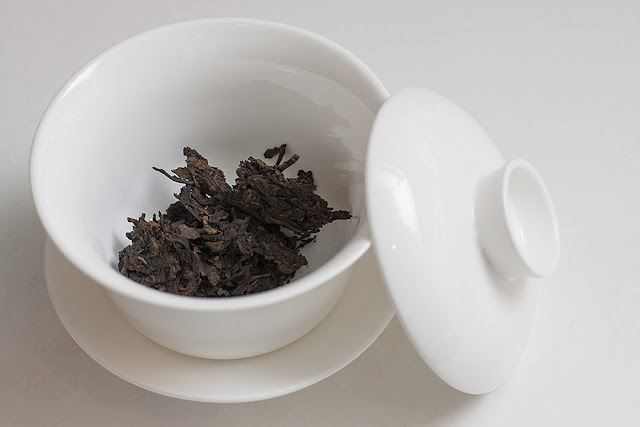 When I first brewed the Xiao Fa Tuo, I wasn't too surprised to find that it has a taste consistent with the aroma-- it had the horse farm and tobacco barn flavors in addition to some smoke and clay flavors. The mouthfeel is quite interesting-- it's thick, yet it feels very soft/smooth too; almost as if the volume of tea weighs less than the same volume of water would if physics did not have laws. Tasting such an earthy tea for the first time was a strange experience though. I definitely liked the tea, but I wasn't sure if I loved it. It was certainly different from all other teas I have had in the past. 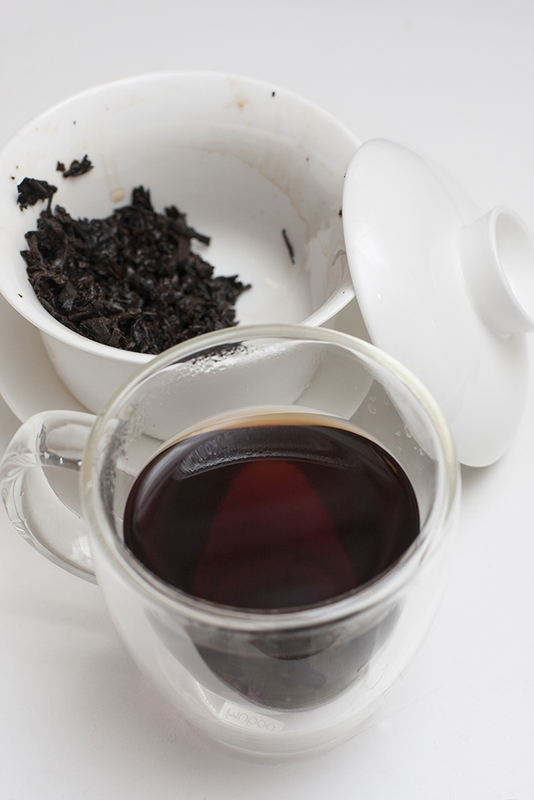 I had heard though that puerh can change a lot over subsequent steepings so I kept steeping it to see what would happen. Around the 5th or 6th steep I noticed that the flavor mellowed out quite a bit to reveal flavor characteristics of leather and wood. This tea went from good to amazing! The later steeps brought back more memories. The wood flavor notes reminded me of an incense that my old college roommate and I used to burn. He acquired this incense in a large jar from his older brother and it had no packaging, labels, or wrapper. We actually had no idea what scent it was supposed to be. We just knew it as the velvety reddish-purple sticks among the assorted rainbow in the jar. But the woody note in this tea is the same. Perhaps it is cedar? Not freshly cut cedar though, but that of an old cedar tree that has long since fallen to the ground where the forest has had some time to try to reclaim its nutrients; a microbial process happening over time like the microbial process that created this tea. In addition to this tea bringing back memories from long ago, this tea also has new memories attached to it that are now locked within the green box. When I see this tea I think of the night I bought this tea in December 2011. I had gone in to the tea shop while my wife and I were waiting for our turn to ride a horse-drawn carriage around a block of our town. It was the third time we had ridden in one; the second was at our wedding, and the first was on the night of our first date. Also that night we visited my good friend's parents who had both been battling cancer. That was the last night I saw either of them before they passed away months later. The days following the purchase of this tea I also came down with strep-throat and felt horrible-- That week of strep throat with high fever and swings of chills still sits within the top two or three moments of the worst I have felt in recent memory. Every time I saw the green box for a while I kept thinking about how awful it felt having strep throat, which caused me to delay drinking this tea for over 3 years after buying it. It was like Beethoven's 9th in A Clockwork Orange. So I pushed the puerh to the back of the cabinet to let the memories fade a bit, like a strong shou puerh wo dui aroma. I'm glad I decided to pull this tea back out and finally give it a try. It has helped opened up the world of tea for me and has since lead me to discover and try many more teas. As I explore them one by one and continue to learn more about tea, I enjoy creating new tea memories as well as revisiting the old ones.